As Lawmakers Pull Out, HD Kumaraswamy Says Is This How PM Cleans Up Society? As the pullout of two independent lawmakers triggered talk of the Janata Dal Secular-Congress coalition tottering after seven months, Chief Minister HD Kumaraswamy said he was "totally 100 per cent confident" that his government is stable and will complete five years. "There is no threat to my government. Prime Minister Narendra Modi has to answer how the BJP and its friends are trying to destabilize the government. Modi criticises corruption. He says he wants to clean up the society. This is how he cleans up the society? By poaching MLAs from the Congress-JDS? And keeping his MLAs in a resort," Mr Kumaraswamy, who came to power in May, said to NDTV. The Chief Minister said as far as he was concerned, the two independent legislators who left - H Nagesh and R Shankar - were write-offs from the beginning. "I expected them to leave anytime. I am not surprised at all and didn't even try to stop them. I have always taken 118 as the real strength of the coalition (113 is the majority mark in the 224-member assembly)," he said. The pullout of the two lawmakers on a day the Sankranti festival was celebrated across India, came after a build-up over the past three-four days. BS Yeddyurappa flew down more than 100 BJP lawmakers to Delhi on Monday. 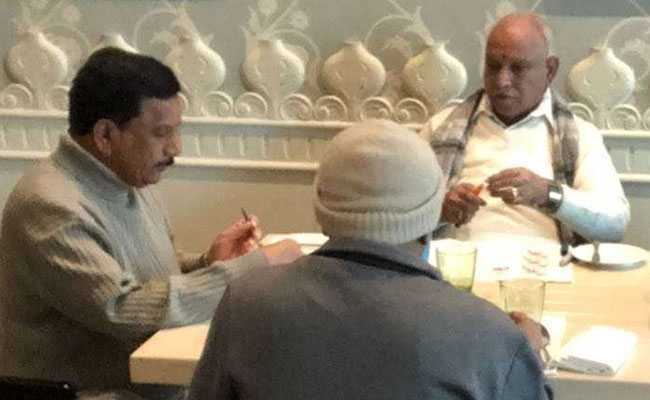 Three Congress lawmakers have been "missing" - or at a Mumbai hotel - and are out of touch with their party, leading to the party's DK Shivakumar expressing fear that the BJP had launched another edition of its "Operation Lotus". The term was first used in 2008, when the BJP was accused of inciting several opposition legislators to defect to ensure the stability of its government headed by BS Yeddyurappa. But Congress leaders now maintain that the MLAs are in touch and are going nowhere. One of them, Anand Singh, did surface at the Kumara Krupa Guest house where the poitical meetings were on. Chief Minister Kumaraswamy also came here in the afternoon to confer with the Congress leaders after the independents withdrew support. Mr Yeddyurappa, however, flew down more than 100 BJP lawmakers to Delhi on the weekend, alleging attempts to poach them. They are at a resort in Gurgaon near Delhi. Mr Kumaraswamy said the "missing Congress MLAs are my friends, they are in touch with me." The BJP, he said, could "enjoy" trying to bring down the coalition for another three-four days but would not succeed. "From day one Yeddyurappa wanted to disturb the government. But this government is solid as rock," he said. As for reports that the Congress lawmakers who had gone MIA were upset about his recent cabinet changes, the Chief Minister said: "I know how to cool down all these issues, to sort it out smoothly... I am doing my job without advertising it."